Small piece of Fighter Beat track, looped several times. It kills all lossy codecs on all beatrates. It's not enough to say it, you need to provide ABX logs in order to comply with our terms, especially when making incredible claims like the one you just made. Yes, I know. I just looped the most hard for encoders part of it, so that the difference can be heard more clearly. My iRiver player does not support lossless, so I use Vorbis q10, and I can hear the difference between it and Vorbis Q9, Musepack q10 and Nero AAC Q1 (max. bitrate). It looks like converted tracks sounds slightly quieter, almost indistinguishable. Dont know why, but on PC it is harder to hear this difference (maybe because it is AC97?). Probably, I should try test it more strenuously. Anyway, this sample is the best I could find for testing audio codecs for myself, and I hope people who make listening tests pay attention to it. LOL, the same as Fighter Bit. I quickly tested(Not ABX) the sample with Vorbis at 160Kbps and Opus at 160Kbps CVBR. The Vorbis encode sounds very different from the original. With the Opus encode I don't know if I am actually hearing a difference or not. I probably will have to do an ABX. I quickly tried both Nero from 7-Feb 2006 using -q 0.3 -lc and Lame 3.98.4 -V3 and do not believe I would be able to pass an ABX test. So yeah, "kills all lossy codecs on all btrates" is an overstatement. I have to question the reports in the aforementioned thread as well. @softrunner - Please take the time to run ABX tests in foobar2000. 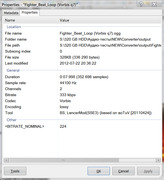 In the meantime, I suggest this thread be retitled by an admin to just "Fighter Beat loop" with the subtitle "possible problem sample for Ogg Vorbis encoder; ABX testing needed". Or something along those lines. Never thought that such a regular sample could be that badass. Encoding with lame -V0 gives a bitrate of 314, so it certainly knows it is up against something. I've never seen anything like that. Some of my highest-bitrate FLACs, do end up between 245 and 255 when lame -0'ed. Including the least-compressible harpsichord piece I have. 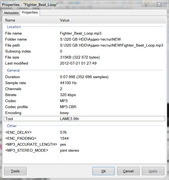 In the lossless department: TAK -p4m encodes at 1037. 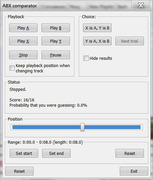 FLAC -8 encodes at 978, that's 5.7% better. WavPack extra high at 837. That's a 14.5 percent better than FLAC -8 and 19 percent better than TAK -p4m. 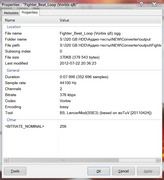 I have never before seen any sample where TAK -p4m is beaten by 200 kb/s. Ok, now I've done an ABX test of MP3 on PC, because MP3 is too obviouse to recognize. 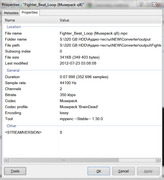 The difference in files is that in the original sample there is a sharp background scratch, and in the mp3 sample it is smoothed so that I just cannot here this information there. The same story: no sharpness in the background noise (right channel). Have you tried Opus with this sample? Provide results for mpc and aac and I think we've got our bases covered. It looks like the amplitude of a saw-like sound in aac sample is lower than in an original one. Please reassure me that I'm reading this wrong, or somehow out of context. I couldn't ABX lame -v2. But its a hard sample (for me at least) because its so noise-like. Looking at it in the time domain is very interesting though. With the lowpass disabled, the time domain versions of the MP3 and lossless look nearly identical, with just a tiny bit of extra quantization noise in the lossy version. I would have expected the impulses to give the transform more trouble, but that doesn't seem to be the case. I can't do it with AAC at v-5. This is just the turn of speech. What I meant is that the wavy signal, that sounds like a power-saw, in AAC has less max. volume than in the original sample. I couldn't ABX lame -v2. You can focus your eyes on some object, but the most information still comes from peripheral seeing. The same in hearing. Dont try to focus on particular sounds, otherwise you will miss the most information. That's how I do it: just trying to listen via unfocused peripheral hearing, and the sound shows its difference itself. Now I'm getting curious: can you nail down a freeformat@640? I haven't used Windows in years. But from what I read here, fb2k outputs Opus files at 48000Hz. So, how does foo_abx handles files with different sample rates? Or is that irrelevant because the audio reaching the output device is mixed with a certain sample rate supported by the device? can you nail down a freeformat@640? 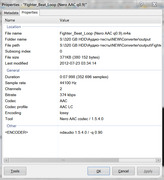 If you mean "lame.exe --freeformat -b 640 *.wav", I cannot find how to decode it. Anyway, it must be useless. If you decode it into wav, it will be 44kHz, so I think it is ok.
No, Opus will not decode at 44100 Hz by default. 2012 is correct; please actually read what people say, rather than just waving it away. I presume foo_abx intelligently resamples, probably both files to a common rate (the higher of the two? ); I would certainly welcome confirmation. Anyway: Thanks for all the tests! They make TOS #8 happy. Opusdec will decode at 44.1kHz, if the opus file was sourced from a 44.1kHz WAV. Maybe that's what softrunner meant.